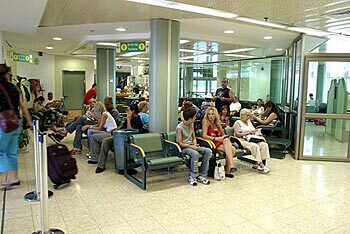 Haifa Airport was established by the British in 1934, as the first international airport in Israel. The airfield answered the needs of the British Army in the Land of Israel and the joint Iraqi British oil company (APS). Throughout the years of their rule in this country, the British saw the town of Haifa as the most important industrial and commercial center of Palestine. Within this concept they developed the bay and established important functions there, such as: oil refineries, an Electric Corporation power station, the Haifa Port Authority, and of course, the airport. The airport is located at the eastern entrance to the town of Haifa, close to Kishon Port and Israel Shipyards, within the area of the Israel Air Force Technical School. The airport mainly serves civilian traffic, and some military traffic. At the Technical School a collection of the Air Force’s historical planes from the War of Independence to the present is on display. 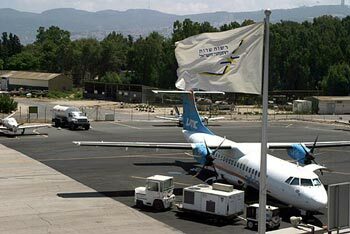 Haifa Airport is called after Uri Michaeli (Sarman) (1900-1976), one of the pioneers of Jewish flying and among the founders of aviation in Israel. Michaeli was the manager of the Aviron company before the establishment of the State, and afterwards the head of the Civil Aviation Wing in the Ministry of Transport, and General Manager of the National Council of Civil Aviation. In the past there were three takeoff and landing runways in the airport, of which only two are still in existence, and only one is currently used for takeoff and landing. In 1936 regular air routes to Beirut and Cyprus were opened, and in 1938 a regular air route to Europe and Italy was opened. In addition, civil air charters operate at the airport to other destinations overseas. In 1938 a third of the flights into Israel landed in Haifa. 1940-1948: Civil flights were stopped due to the Second World War and British involvement. 1940-1945: The airport served as part of the Royal Air Force’s means of operating in the Middle East throughout World War II. Later, the airport served the Israeli Air Force. 1948: The Cypriot airline Cyprus Airways was the first company to renew regular flights to Israel. In 1958, Arkia renewed flights, followed by Israir in 1996, Aeroel in 1998, followed by Royal Wings from Jordan and Scorpio from Egypt. April 1998: A new terminal is opened to provide all the services required of an international airport, including: border control, customs and duty free shops. OPR HOURS Opr 0430-2100Z++ Sun and Tue, 0400-2130Z++ Mon and Wed, 0430-2130Z++ Thu and Sat, 0430-2030Z++ Fri .
RSTD Avoid refinery S of arpt. PPR for intl flt btn 0430-1630Z++. The only auth use is by emerg acft and copters ldg/dep USN ships in port at Haifa. RWY Rwy 16 LDA 3865', TORA/TODA 4029'. Rwy 34 LDA 3563', TORA/TODA 3940'.